The verdict from the Dr was that he has to go back in two weeks! The bone is starting to heal though, which is a good thing and the Dr said Ebi-kun could join the sports festival as long as he didn't use his arm! 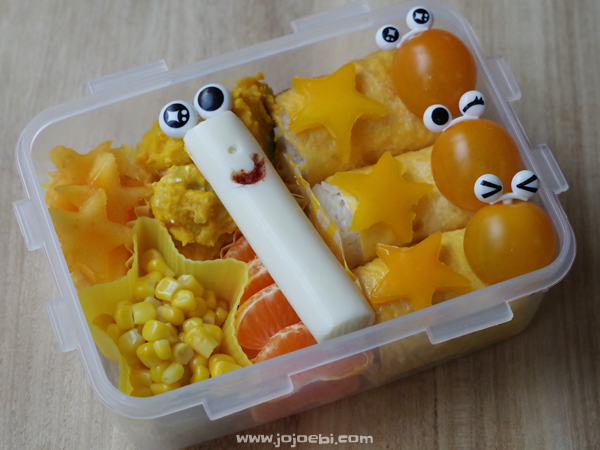 So this is his lucky yellow bento since he is in the yellow team this year. then of the left are chestnut rice rolls wrapped in thin omlette, yellow pepper stars and yellow mini tomatoes.